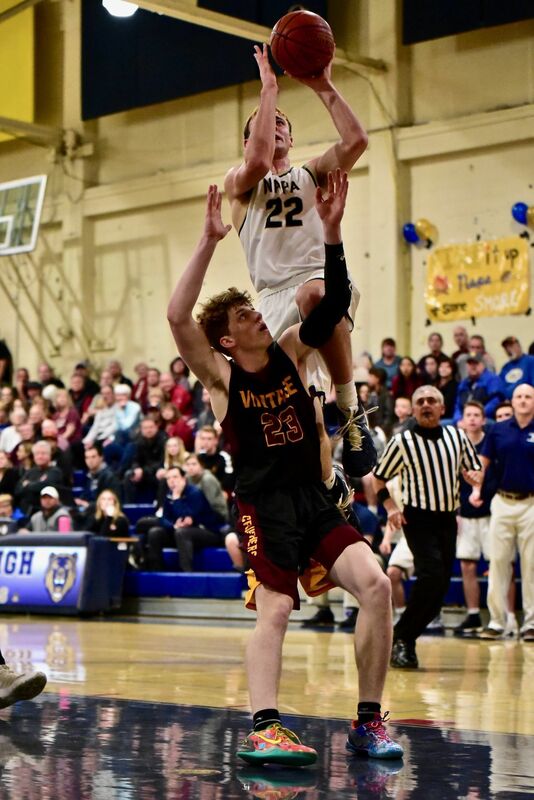 Napa High sophomore Brock Bowers (22) soars toward the rim over Vintage's Blake Murray on Wednesday night. Vintage senior Grant Polk tries to block a shot by Napa High senior Zach Swim's shot as senior teammate Hunter Gutierrez looks on Wednesday night. Napa High senior Stephen Blume passes the ball as Vintage sophomore Logan Nothmann defends Wednesday night at Napa High. Vintage junior Loren Castro shoots while defended by Napa High senior Zach Swim on Wednesday night. Napa High freshman Tyler Oda drives for a layup against Vintage senior Grant Polk on Wednesday night. Vintage junior Blake Murray shoots between Napa High's Tyler Oda (13) and Logan VanZandt (21) on Wednesday night. Napa High head coach Zack Cook talks to his team during a timeout Wednesday night. Vintage head coach Rob Johnson talks to his team during a timeout Wednesday night at Napa High. Napa High sophomore Brock Bowers shooting against Vintage senior Grant Polk on Wednesday night. Vintage senior Grant Polk (32) shoots against Napa High sophomore Brock Bowers on Wednesday night at Messner Gym. Napa High's Zach Swim shoots against fellow senior Grant Polk of Vintage on Wednesday night. Napa High defended its home court in the first boys basketball Big Game of the year Wednesday night, knocking off crosstown rival Vintage 64-56 behind a pair of double-doubles from senior Zach Swim and sophomore Brock Bowers. The Grizzlies improved to 11-5 overall and 3-0 in Vine Valley Athletic League play, while Vintage sank to 6-10 overall and 1-3 in the VVAL standings. Swim put up 13 points, 10 rebounds and two assists while Bowers one-upped him with a nearly identical stat line of 13 points, 11 rebounds and two assists. Bowers led a trio of productive underclassmen for the Grizzlies, who also got solid performances from freshman Tyler Oda (four points, four assists, one rebound) and sophomore Brayden Greenlee (11 points). While Bowers and Oda are starters for Napa, it was Greenlee who gave the team the spark it needed to pull away in this one. Ahead 28-23 at halftime, the Grizzlies pushed their lead to 50-37 at the end of the third quarter after Greenlee did his best Klay Thompson impression, nailing three straight catch-and-shoot treys as he scored all 11 of his points across a four-minute span. To boot, all three of Greenlee’s deep shots came off second-chance points. Considering that the Crushers lost by just eight points, this may teach them a positive lesson about crashing the glass in the long run. The Crushers actually boasted both of the game’s top scorers in senior Grant Polk (17 points, eight rebounds) and junior Blake Murray (14 points, four rebounds). Murray made the play of the game in the third quarter when he grabbed a steal and rumbled into the lane to dunk over a helpless Napa defender. The emphatic slam brought all Vintage fans in attendance to their feet, but any momentum from the play was lost thereafter as the Crushers trailed by double-digits until the final seconds of regulation. 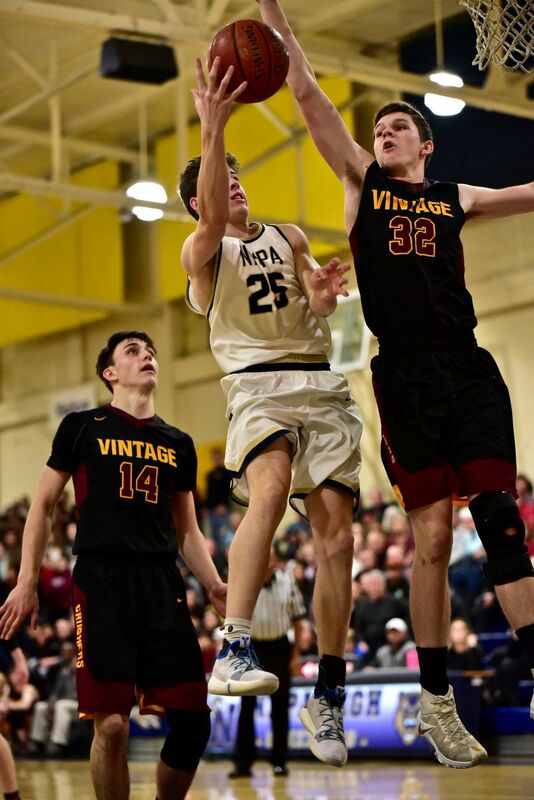 Vintage will look to snap its three-game losing streak on Friday night when it faces Sonoma Valley at home. Meanwhile, the Grizzlies will put a four-game winning streak to the test when they square up with the only other undefeated VVAL team – American Canyon. Alex Dehzad had 16 points Josh Kho and Everett Mitchell each added 10 as the Crushers improved to 2-2 in the VVAL and 8-5 overall. The visiting Crushers (8-3, 3-1 VVAL) outscored the Grizzlies 29-8 in the second half by generating turnovers and keeping Napa off balance. Vintage had 11 players score, led by Dustin Wyman’s 10 points and Cole Capitani’s eight points and 10 rebounds. Daniel Mitchell scored six, and Omar Hernandez, Liam Alexander and Bryce Powers each had four points. The Grizzlies (1-11, 0-2 VVAL) were led by Andrew Remboldt's nine points, six rebounds, two steals and two blocks, and the defense of Ross Cringan.